Here’s to another week of DFS and hoping you did well. We faired a lot better last week than we did in week 4. So, let’s get right to it. T.J. Yeldon (26.2 pts): Last week’s “Steal of the Week” came through. Every now and then, we nail it. Yeldon seriously outperformed his salary of $5,600. He finished with 10 carries for 53 yards (5.3 YPC) and 8 catches for 69 yards and a score. Just to give you perspective, Melvin Gordon scored 22 pts and his salary was $3,000 more than T.J.’s. Money. Blake Bortles (28.6 pts): Only Bortles can throw for 430 yards and score only 1 TD. He can, however, get you 5 turnovers. Luckily, he also rushed 34 yards and he found the end zone. Blake did outscore the likes of Deshaun Watson, Big Ben, Matt Ryan, and Russell Wilson at a discount. STACK / Jared Goff (19.31 pts) + Robert Woods (19.5 pts): Oddly enough, Woods rushed twice for 53 yards, while Zeke ran for 54 yards on 20 carries. Ouch. Woods also caught 5 balls for 92 yards. Not too shabby. Goff didn’t explode like he usually does, but he did lose Cooks and Kupp due to concussions. STACK / Matthew Stafford (15.2 pts) + Kenny Golladay (19.8 pts): Boy, I love me some “Baby Tron”. He’s currently WR17, averaging a steady 16.8 PPG. He’s only had one week below double digits. Even then, it was 9 pts. Not bad for a guy that was drafted WR51 in redraft leagues. Unfortunately, Stafford is only ranked QB15 and his success is purely match-up dependent, which works just fine for us playing DFS. Though you didn’t win the big tournament with this stack, I’m willing to bet you fared well in 50/50 and heads-ups play. Titans DST (13 pts): Though only recording 1 INT and 1 sack, the Titan’s DST only allowed 13 pts, which nets you 13 pts total and finishing DST8. Chris Thompson (12.2 pts): It pains me that he only finished with 34 rushing and 45 receiving yards on 21 scoreless touches. Leave it to Gruden to employ Kabri Bibbs for the TD on the goal line. No, that’s not usually Thompson’s role, but Gruden didn’t even line up AP. He could have ran a play action and a quick toss to Thompson on the outside. Easy money. But, no. Gruden decided it’s better to draw up a goal line slant for Thompson on a 2-pt conversion. Good call. Now he’s hurt. It’s safe to say I’m not a fan of Coach Gruden, either of them. Tyler Boyd (8.4 pts): With Boyd averaging 20+ FPPG over the past 3 weeks, it’s surprising he only saw 7 targets in week 5. The Bengals ran the ball more than usual and had a lot of fun with their lead RB Joe Mixon back in the line up. 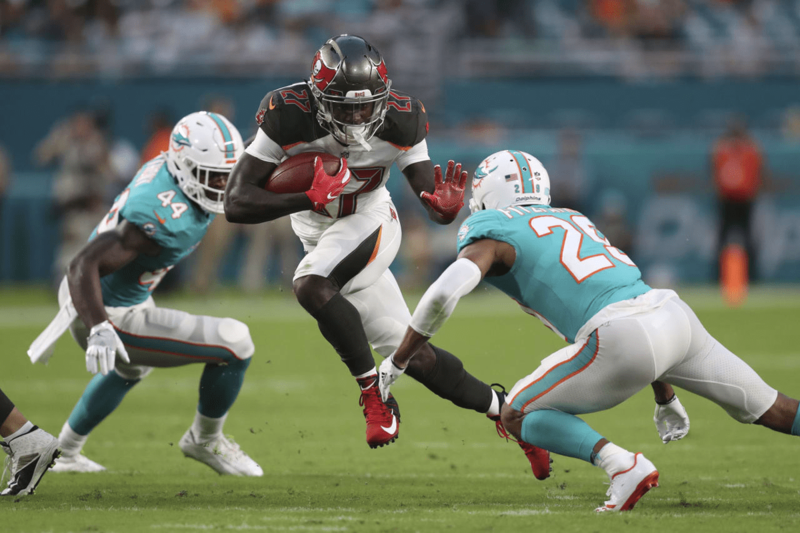 Calvin Ridley (7.8 pts): His points over the past 3 weeks: 21.5, 43.5, 16.7. In his defense, Matt Ryan had a Matt Ryan day. I won’t dig into Ryan too much since he has averaged 33.7 FPPG over the previous 3 weeks. It was just a bad day for both. The last time both had a bad day was week 1. However, I do like them both for a major rebound game this week at home against the Bucs’ porous secondary. 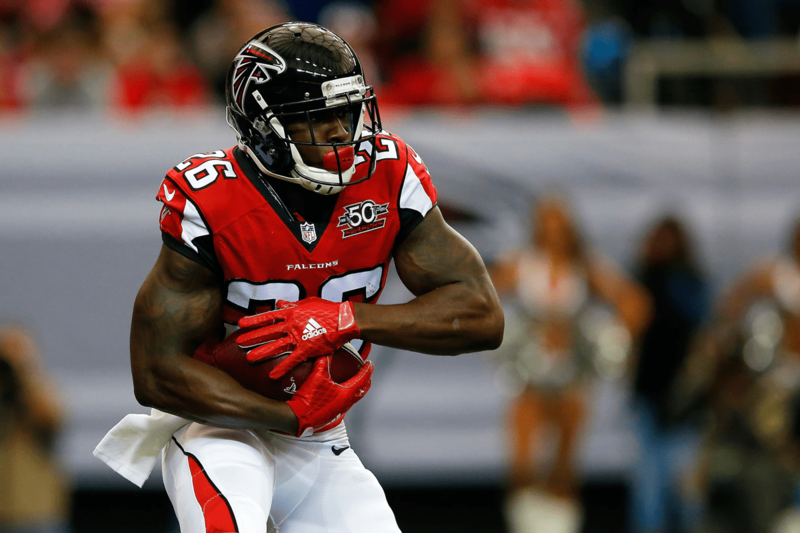 Tevin Coleman, RB (ATL) $5,400: Devonta Freeman was ruled out, once again leaving Coleman (11.99 FPPG) as the workhorse against Tampa Bay. The Buccaneers rank 4th against the run, only surrendering 87.8 YPG (3.9 YPC) and a total of 4 TDs to RBs so far. At face value, that doesn’t seem to bode well for Coleman. However, the Bucs rank dead last against the pass and 1/3 of Coleman’s production is through the air. Every time the Falcons are in the red zone, Coleman should get at least 1 shot on the ground, if not in the passing game to find the end zone. Atlanta ties for 8th (65%) in red zone scoring percentage. Jameis Winston, QB (TB) $5,800: All signs point towards a shootout between Matt Ryan and Jameis. They both have the tools, the supporting cast, and bottom end pass defenses to play against. 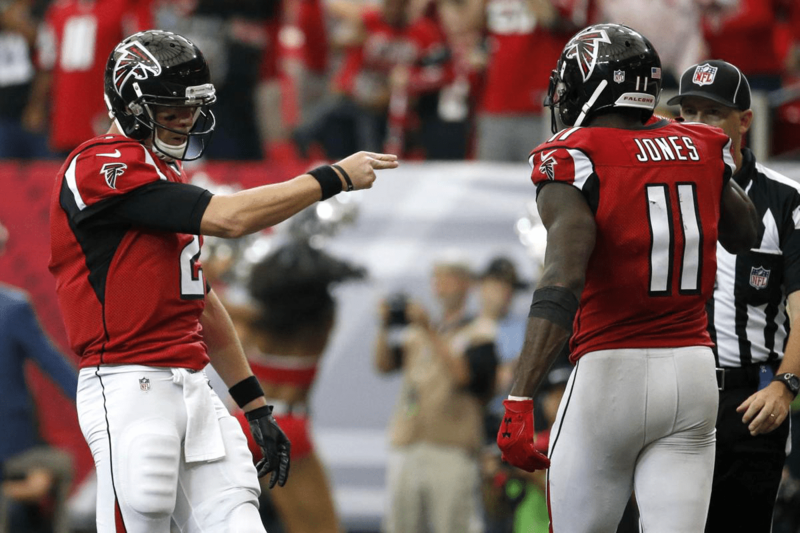 The Falcons are perched at 23rd against the pass (277.2 YPG and 12 TDs scored against). Here’s to hoping Jameis is fired up, motivated, and given the right game plan over their bye week. He’s easily a week 6 streamer and a solid DFS gamble. Bilal Powell, RB (NYJ) $4,500: Last week he had 20 attempts on the ground, though he only gained 99 yards. It was Isaiah Crowell that had the monster game. However, the split carries at 20 touches is impressive and more so, it looks like Crowell might be ruled out for this week. The word on the block is that Crowell is a game-time decision. Even if he goes, Powell should get another 20 rushes against the Colts’ 18th ranked run defense (106.8 YPG and 5 rushing TDs given up). At $4,500, I like him. 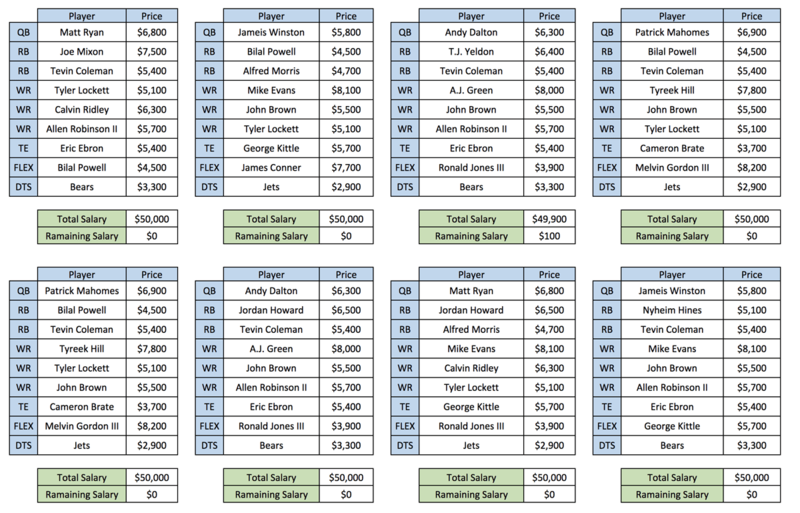 Alfred Morris, RB (SF) $4,700: If you’re playing games up until Monday night, fire up Morris if – and only if – Matt Breida does not suit up. Morris immediately becomes a volume-based RB2 against the Packers’ middle of the road run defense (105.0 YPG and 5 TD’s surrendered). He makes a solid flex play and should give you 10+ points. Allen Robinson, WR (CHI) $5,500: Everyone seems to continue to fade ARob. He’s a top tier talent. No question. It’s just the Bears have yet to figure out how to get the most out of him. He averages 8 targets per game, which seems like he should average more than 54.25 YPG and score more than 1 single TD. In a game where Trubinsky threw 6 TDs, Robinson only saw 4 targets for 23 yards and a score. Come to think about it, I’m starting to fade him as I write this. I mean, come on. However, however…I have faith that former Oregon head coach and studio analyst, Mark Helfrich, now OC of the Bears, better incorporates Robinson into his fast-paced style of offense. They had two weeks to prepare. I’m going with my gut. I added a category this week for players that are high-risk, high-reward. Let’s face it, there’s always that one big surprise performance from players we never suspect. Think Ryan Fitzpatrick in week 1 and Mitchell Trubisky in week 4. Ronald Jones III, RB (TB) $3,900: The Bucs drafted Jones in the 2nd round this year, 38th overall. It made sense at the time considering his production at USC over the past 2 years. However, he struggled throughout camp and during the preseason, so much so that he was a healthy scratch for the first 3 weeks. Jones was activated in week 4 due to Peyton Barber…well, being Peyton Barber. 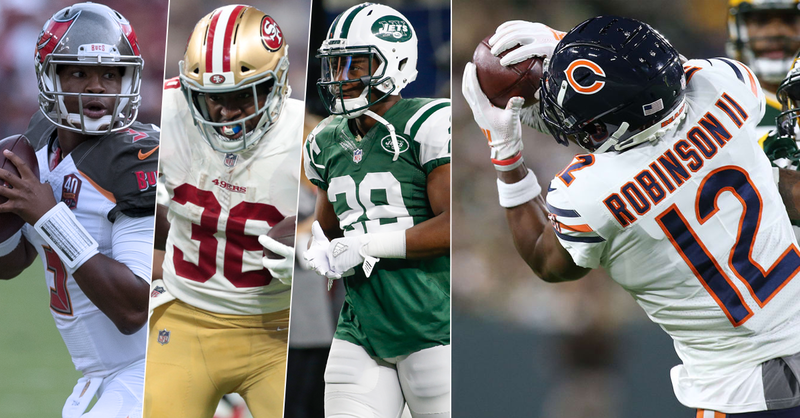 Jones is a sneaky play this week and if he breaks out against the leagues 2nd worst rank defense against the run (121.4 YPG and 8 rushing TDs allowed), he’ll be the top waiver wire add for week 7. Beyond DFS, if you have space on your bench, take a shot and pick him up as a FA before he gets on everyone’s radar. The salaries and PPG are taken from Draft Kings. Entering 50/50 contests is the absolute best way to win and double your money. If you decide to go all in and chase the big money, just be sure to enter a few 50/50 DFS contests to ensure you win your money back. Let’s get ready for another exciting week and good luck to you and your lineups.